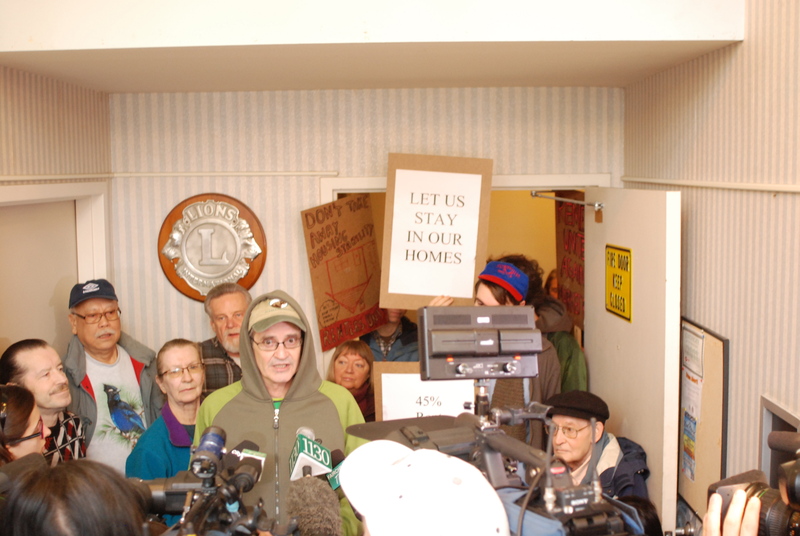 Three dozen seniors living on fixed incomes in the Lions Manor building at 6th and Main have been served with a 45% rent increase. In a city with an ever-worsening housing crisis, the tenants could be faced with the possibility of having nowhere to go. The rent-increase hearing is scheduled for today (February 10) at the Residential Tenancy Branch. The hearing will take place by phone, adding even more anonymity to the fact that the building owners have not yet met face-to-face with the seniors to discuss the increase. Despite pressure to revoke their application, including a rally outside the Lions Manor yesterday, the Mount Pleasant Housing Society has confirmed that it will pursue the rent increase as planned. In an extensive conversation with The Mainlander, Mount Pleasant Housing Society president Christine Norman confirmed that if the hearing comes down in favor of the tenants, her organization will appeal the decision. “We will do whatever we have to do to win the case,” said Norman by phone. A landlord may apply under section 43 (3) of the Act [additional rent increase] if one or more of the following apply: (a) after the rent increase allowed under section 22 [annual rent increase], the rent for the rental unit is significantly lower than the rent payable for other rental units that are similar to, and in the same geographic area as, the rental unit. This loophole puts all renters in gentrifying areas at risk. The neighborhood surrounding Lions Manor is part of what the Vancouver planning department calls the Main Street revitalization corridor, stretching from Alexander Street south to 36th Avenue. The advancement of the condo frontier up Main Street has widened the rent gap between the ground rent and highest-best use capitalized rent, increasing the return on capital in the area. As such, market rents bear no reflection of the actual costs of tenancy but rather of the opportunity cost of capital. The Residential Tenancy Act exists to protect renters from the most exploitative aspects of the housing market, but Section 23(1)(a) cancels out the very purpose of the Act. MPHS states that it needs a 45% revenue increase to funds its renovations, although Norman would not speak further for fear of “jeopardizing” her case before the Residential Tenancy hearing. According to Norman, the building should have been repaired 10 years ago. Balconies were left to decay by the Lion’s Club and only repaired when they became a safety hazard. When asked if the city or province should fund the renovations of senior’s buildings in Vancouver, Norman stated that she’s “not so sure about that.” Despite balking at government subsidies, however, the MPHS is currently accepting a special renovations grant for its window upgrades. The MPHS is also a federally tax-exempt organization. Municipally, the MPHS also receives a special tax bracket for the Lions Manor property, which the City treats as a commercial rather than residential property — combined business taxes in Vancouver are among the lowest in the world. Comparing the Lions Manor to other market rental units in the area is therefore false. The comparison is especially outlandish when it is realized that the two commodities being measured within the “geographic area” are apples and oranges: on the one hand a 40-year-old low-cost rental building, on the other, new highrise units like the one kitty-corner to Lions Manor. The owners of Lions Manor have also opted not to apply for subsidies, taking the position that it would be best for the seniors to pay the MPHS’s mortage. According to Norman, the subsidy application process is too much work for a non-profit like the Lion’s Club. “You have to do paperwork every month to apply for those subsidies.” In addition to not applying for rent subsidies, the MPHS turned down BC Housing’s offer of a $500,000 renovation grant in 2010. According to Norman, the BC Housing grant had “extreme strings attached.” BC Housing wants to “take control” of Lion’s Manor, including the possibility of “tearing it down and building their monstrosities,” according to Norman. Such a move would not be uncharacteristic of BC Housing, who recently sold and demolished nearly 300 units of social housing at Little Mountain to property developer Holborn. BC Housing has also taken over non-profit housing from First United, with plans to change the tenants of those buildings. Revenue from rent covers the costs of the management and maintenance of Lions Manor. According to Norman, “anything that goes to the Lions Manor comes from the rents”. The Lion’s Manor and Mount Pleasant Housing society are therefore “self-funding.” The same cannot be said of the Lion’s Club, who collects 4% of the rents of Lions Manor for its own operations. Through their actions it is clear that the MPHS is out of touch with the residents that they claim to serve. For most of the tenants, the management of the building has come across as secretive and top-down — yet the society receives both grants and tax exemptions by capitalizing on the “non-profit” status of their work. MPHS, like many other non-profit housing societies in Vancouver, is managed through an undemocratic structure that is unaccountable and untransparent to the people that are directly affected by its decisions. The municipal government has to stop promoting the gentrification of low-income neighborhoods. This would include a moratorium on new market developments and re-zonings until exploitative laws like the geographical area loophole are abolished and renter’s rights are secured. *33% is also the affordability cut-off as ruled by the Canadian Mortgage and Housing Corporation (CMHC) and the United Nations (UN). Posted in City Hall, Gentrification, Homelessness, Housing, Interview, Mount Pleasant, News, Uncategorized. Bookmark the permalink. The “Main Street Revitalization Corridor” runs all the way up to 36th? What, exactly needs to be “revitalized” south of Broadway? Have the residents, owners and renters alike, been asked if the want to be the recipients of the city’s revitalization munificence? What level of government is this provided by? A correction to Vancouver’s unaffordability is heading our way. Vision “Lost in Space” Vancouver and their developer buddies will not be able to take credit for it. Are you aware that Mount Pleasant Housing is now going to the Supreme Court to appeal The Tenant’s Board decision?